With three days in Reykjavik, you have plenty of time to soak up the city’s atmosphere, see the historic sights, and journey into the surrounding countryside to see some of Iceland’s most famous natural attractions. Here are a few ideas for how to spend three days in Reykjavik. 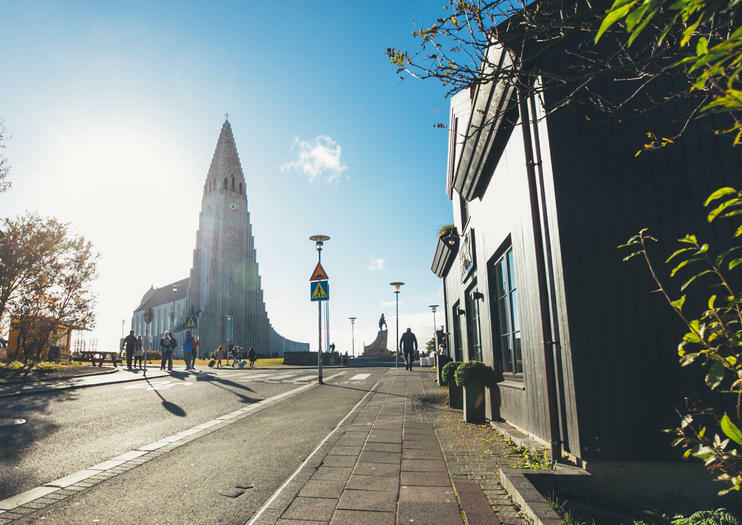 Walking tours are an enjoyable way to explore Reykjavik and get your bearings, thanks to the city’s compact size and the close proximity of attractions such as Hallgrimskirkja Church and Harpa Concert Hall. Alternatively, hop-on hop-off bus tours allow you to set your own itinerary with 24-hour tickets, so you can spend the whole day exploring at your leisure. In winter, you’re likely to be able to see the northern lights. To maximize your chances, leave the city on an aurora borealis night tour. It’s a good idea to schedule this for the first night of your trip as, if you do not see the aurora that night, some tours offer a complimentary second tour the following night. If visiting outside winter, book an evening visit to the Blue Lagoon instead. Traversing the Golden Circle is a must-do. The route, which is easily accessible from Reykjavik, is made up of three main attractions: Thingvellir National Park, Geysir geothermal area, and Gullfoss waterfall. Most guided Golden Circle tours take a full day, with some including additional excursions, such as snowmobiling on a glacier or visiting the Secret Lagoon. Iceland’s south coast is another popular day-trip destination. Visit on a full-day private or group tour to see Seljalandsfoss waterfall (which you can walk behind) and the black-sand beach and basalt columns of Reynisfjara. The Icelandic horse is famed for its hardiness, charming looks, and uniquely smooth gait, called tölt. You’ll likely see some as you travel the countryside, but for a closer experience, book a horseback riding tour. These typically include transportation from Reykjavik to a countryside farm and continue into scenic surroundings of mountains and lava fields. If you prefer to watch animals from afar, join a whale-watching cruise from Reykjavik’s Old Harbour, offered year-round but with the most frequent sightings from April through October. In summer, some cruises include visits to nearby Akurey to see its puffin colony. Whale watching and horseback riding can even be combined with one full-day tour. Get close to nature in the way of old Icelanders on your 2 or 4-hour horseback riding experience from Reykjavik, dependent on transfer option. Hop on a small, sturdy, Icelandic horse, a breed originally brought here by the Vikings, and enjoy a relaxing ride through lava-laden scenery past mountains, lakes, and moors. Your 1.5- to 2-hour ride will be matched to your ability and led by an instructor. Hot drinks, riding equipment and round-trip hotel transfers included. Search the skies for the Northern Lights on a guided, 2.5-hour boat cruise from Reykjavik. The still waters of Faxaflói Bay make an ideal spot for stargazing and catching the sometimes elusive Northern Lights. Learn all about Mother Nature’s fireworks display from a guide, sip a warm drink on board (own expense), and enjoy hassle-free hotel pickup and drop-off (if option selected). Seek out the northern lights on this 4-hour tour from Reykjavik by ‘super jeep,’ a SUV adapted to travel through Iceland’s rugged terrain. Travel out of the Icelandic capital and deep into the countryside, where you’ll search for the best spots from which to view the spectacle. If luck isn’t on your side and you don’t see the lights, simply rebook with the operator to take the tour again at no extra cost. This tour is a small-group tour ensuring a more intimate experience. Discover the ‘land of fire and ice’ as you journey between the glaciers and lavafields of Iceland’s south coast. Set out on a private full-day tour from Reykjavik and get off-the-beaten-track as you wind through the Hellisheidi mountain pass and along the coast. Keep your camera close to hand as you pass a startling array of scenery, including the Hekla volcano, and the Myrdalsjokull and Eyjafjallajokull glaciers. Stop to admire the dramatic Seljalandsfoss and Skogafoss waterfalls; the black sand beaches of Dyrhólaey and Vik, and the lush pastures of Mýrdalur valley. Discover the natural majesty of Iceland with the Reykjavik Super Saver, a combination of two popular tours at a discounted price. Realize your dreams of seeing wild whales during a 2.5- or 3.5-hour whale-watching tour and marvel at adorable puffins as you sail the rugged shores of Akurey island on a 1-hour puffin cruise. Enrich your knowledge of the majestic creatures while listening to commentary from a knowledgeable guide on each captivating cruise. Get to know the spirit of Reykjavik on this 3-hour walking tour of Iceland's capital. Follow your guide to the city's most important landmarks, including the Sun Voyager (Sólfar) sculpture, Harpa Concert Hall, the Old Harbour, the multicolored Þingholt houses and the Hallgrímskirkja Church. Along the way, learn about the city's culture, history and traditions through your guide's entertaining commentary. All entrance fees and light refreshments are included. Discover Reykjavik by City Sightseeing bus, and explore the Icelandic capital on a hop-on hop-off tour. Your voucher is valid for 24 hours, so use it to ride around Reykjavik and visit the attractions that interest you most. Hop off to visit Laugardalur Valley, Harper Concert Hall and more, or stay on board for a full loop and listen to the audio commentary to learn about the city. Capture the wild spirit of Iceland's spectacular natural highlights on a full-day tour of the Golden Circle from Reykjavik. Alongside a professional guide, discover magnificent landmarks like Þingvellir National Park and the explosive Geysir Hot Spring Area. Marvel at the magnificent power of Gullfloss Waterfall and then head to the Langjökull glacier to experience an exhilarating snowmobile ride across the ice. Enjoy the convenience of round-trip transportation from your Reykjavik hotel on this unforgettable tour. Experience the splendors of the south shore of Iceland on this full-day trip from Reykjavik. With a guide, borad an air-conditioned mini-bus and explore some of the natural wonders of the country‘s southern landscapes, including volcanoes, waterfalls, glaciers and more. See the magical waterfalls of Skogafoss and Seljalandsfoss, and check out the black sand beach and the basalt cliffs of the popular Reynisfjara beach. Pass through the foothills of Eyjafjallajokull and Hekla volcanoes and, as a highligh, visit the great Solheimajokull glacier, a tongue of ice that dates back 700 years, for a short glacier hike and exploration. Hit all of Iceland's most popular landmarks on this full-day Golden Circle tour from Reykjavik. With your guide, visit Gullfoss, for which the 'Golden Circle' is named and Þhingvellir National Park, where the American and Eurasian tectonic plates meet. Walk down through the valley created by tectonic shift to see where the oldest democratic parliament in the world was founded. Additionally, visit the geyser hot springs, home to the Strokkur geyser, which erupts every 6 to 8 minutes, as well as the Blue Lagoon, the town of Hveragerði and the Kerið crater. Round-trip transportation from Reykjavik port or hotels is included. Saddle up for a day of horseback riding, great scenery and fun during this 7.5-hour excursion from Reykjavik. Novice and expert riders alike are sure to enjoy this journey to Laxnes Farm, located in the idyllic Mosfellsdalur Valley, spending the day riding amidst the local terrain of mountains and lush green meadows. In between rides you’ll stop by the farmhouse for a light lunch accompanied by tea and coffee. A guide, riding helmet and round-trip hotel transport are also covered.